Although the adaptation of Archie Comics' classic series Sabrina, the Teenage Witch was expected to land on the CW as a companion series to Riverdale, the comic brand has officially announced the new Sabrina series has instead landed a 20-episode, two-season, straight-to-series order at Netflix. This means no greater Archie-verse on the CW (for now), but it at least guarantees that Sabrina fans will get two full seasons of the series, and—without censors—the show will be allowed to go to much spookier (and sexier?) places than it would have on network television. A lot of the same creatives that helped bring Riverdale to life will also be bringing Sabrina to the small screen as well. The new show will be written by Archie Comics Chief Creative Officer and Riverdale Showrunner Roberto Aguirre-Sacasa, directed by Lee Toland Krieger, and produced by Berlanti Productions in association with Warner Brothers Studios. Greg Berlanti will serve as executive producer, because his plate is apparently not full enough with fifty gazillion comic book shows already. 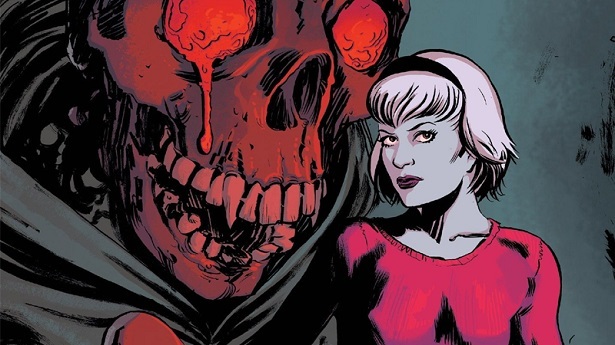 The new, as-yet-untitled series (which we're betting will be called Sabrina for simplicity's sake), will be mostly inspired from the critically acclaimed Chilling Adventures of Sabrina comic book series written by Roberto Aguirre-Sacasa and artist Robert Hack, which gave fans an updated and modern re-imagining of Sabrina the Teenage Witch's occult origins. This dark coming-of-age story deals with horror, the occult, and witchcraft and finds Sabrina struggling to reconcile her dual nature (being half-witch and half-mortal) while protecting her family and the world from the forces of evil. In the introduction to Chilling Adventures' original collected edition, Aguirre-Sacasa said this of the comics' tone: "If Afterlife with Archie was about Lovecraft and zombies and body horror, Sabrina would be more psychological, a bit more subtle (but only a bit), a bit more sexual (as stories about witches often are). There would be less humor than Afterlife, which strives for a Sam Raimi-vibe; this would be more like Rosemary's Baby and The Exorcist and The Omen and Arthur Miller's The Crucible…. A dark, occult coming of age story." If he can translate that to television, we are so very down. One thing is for sure: it seems, based on the description, this version of the classic character will be a total departure from the 1996 Sabrina, the Teenage Witch comedy series starring Melissa Joan Hart. But producer Greg Berlanti loves a bit of stunt casting when called for (See: original movie Supergirl Helen Slater and former TV Superman Dean Cain as Kara Danvers' parents on Supergirl), so don't be surprised if Melissa Joan Hart gets some kind of role on this new series. No firm date has been given for the show's premiere, but it is expected to drop sometime in 2018. Are you as excited as we are for a darker version of everyone's favorite teenage witch? Be sure to let us know your thoughts down below in the comments. Take a look at the first few script pages! Here's why Melissa Joan Hart prefers a Clarissa reboot to Sabrina! And finally, check out 7 Archie Comics that'll seriously spook ya.